Life got even more interesting in high school, and Connor was seduced by the allure of the skies. He took a discovery flight for his 16th birthday and was flying solo within a few months. At 17, he took his first FAA check ride and earned a Private Pilot License to officially join the aviation community. Connor’s success took root in the very home of commercial aviation: St. Petersburg, Florida. He’s an active volunteer with the Albert Whitted Airport Preservation Society and local Chapter 47 of the Experimental Aircraft Association (EAA). 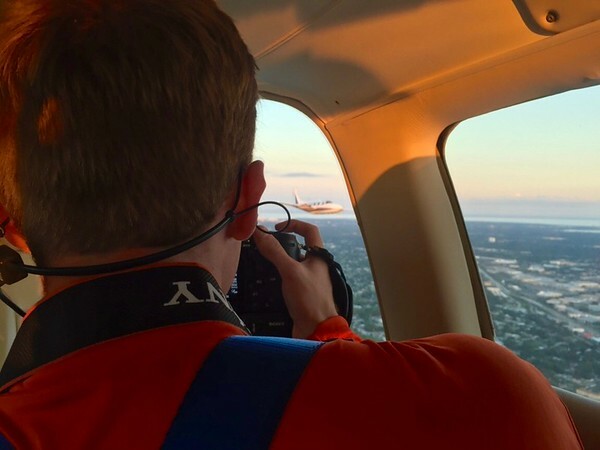 He’s always been proud to give back to the Young Eagles Flight Rally program that helped propel his own aviation career, beginning as an event photographer/videographer and now as a pilot at regular fly-ins for future aviators ages 8-17. In his quest to see the world from a higher point of view, Connor became an enthusiastic and respected air-to-air aviation photographer. He enjoys meeting other pilots and sharing a love of airplanes and the awe-inspiring beauty above the clouds. Connor’s unique ability to coordinate and capture light, scenery, and multiple aircraft results in exciting and inspiring photographic artistry. Combined with his easy-going personality, his commitment to the product and passion for the experience is always a winning proposition. Since completing his Instrument Rating and Commercial Pilot Certification, Connor is on track to become a Certified Flight Instructor in 2018, and continues flight training throughout Central Florida and his home airport, Albert Whitted (KSPG).